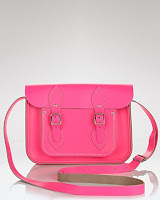 This is my new obsession in handbags, The Cambridge Satchel Company. I received this gorgeous bag as a Christmas gift. While it is on the small size, it's a great weekend bag. It holds my makeup, phone, tissues and my wallet. Normally, I'm not a fan of cross style bags but there is something about this bag that jumps out at me. I think it's the color, it's just fantastic!! !